This manga is the bomb. It's mysterious, slightly terrifying and just romantic enough to keep the ships going without slowing down the story. 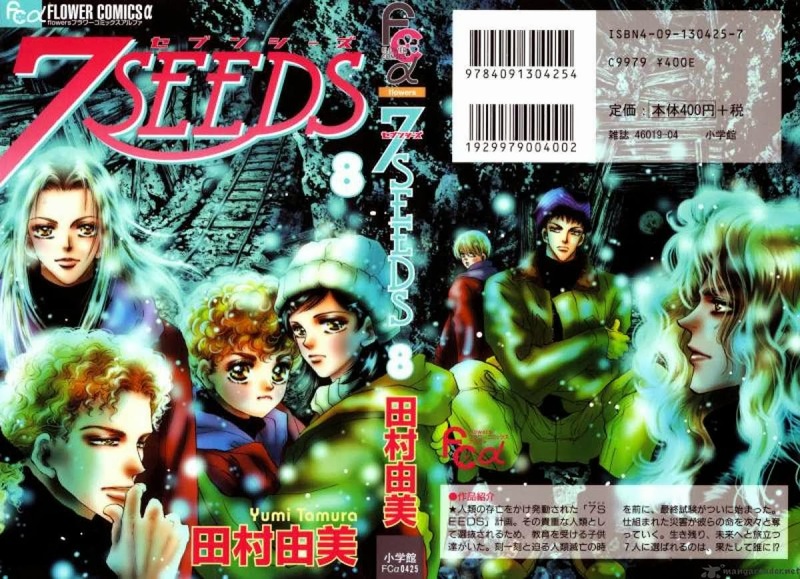 I'm not normally a fan of the post-apocalyptic genre, but 7 Seeds does it with such believable depth and heart that you can't help but get swept into the story and its very distinctive characters. 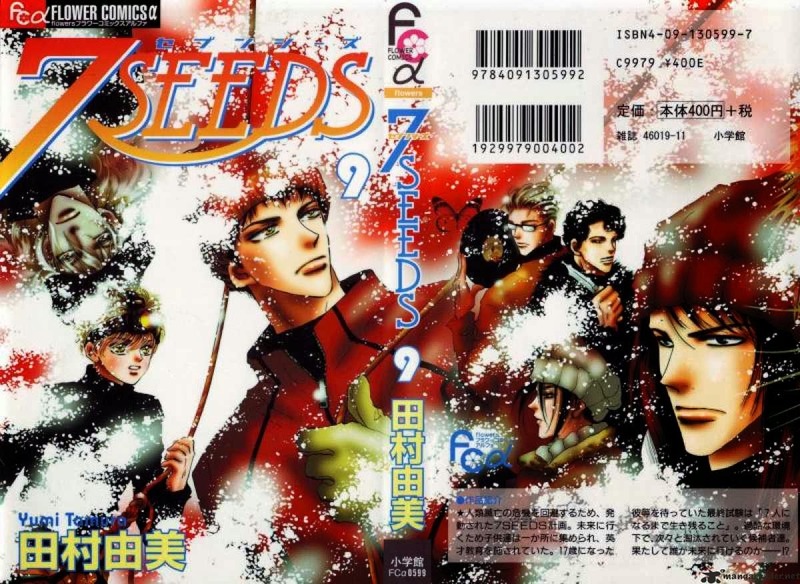 Despite the sheer number of plot lines and the immense cast, the manga never falters in its tale; each arc is interesting and distinctive, and I never once feel the urge to fast forward through it. 7 Seeds tells the story of five teams that wake up in a future world following a mass extinction on Earth (caused by a meteor). Each team consists of seven people plus a guide and are programmed to awaken only when the world readjusts to a livable state. By this point, the entire landscape has shifted - there's new ecosystems, new species, and constant uncertainties. The teams are named after the seasons, with two summer teams, A and B. B is filled with the old-world "rejects" while A includes kids born and bred for the purpose of this project. There's also the inescapable fact that they were all put into this project with the goal of reviving the human species - meaning they'll all have to pair up at some point. Admittedly, it took me a few volumes to get fully invested in the story. The build-up here takes a lot longer than Basara, and I didn't initially care for Team Summer B (which is the first group we meet). Where it finally got interesting was when all the crazy, somewhat terrifying stuff started happening, e.g. the giant desiccated dinosaurs. Like I mentioned in my Basara review, Tamara Yumi definitely does well with action and psychological issues. The latter is especially prominent in 7 Seeds, because we get to follow the stories of not just one person but multiple characters and teams. The psychology of the characters is beautifully thought out and fascinating to watch. In fact, I like everyone so much here that I don't think there's a favorite character. There are ones I'm less excited about (Ango, Arashi because he's a bit of a snore, and the Madonna aka Ayu), and ones I'm fond of (Aramaki and Semimaru, who's hilarious seriously cute with Natsu). In terms of the pairings, I originally liked the idea of Ango with Hana (though that'll never happen now thanks to the molestation scene). She seems like the one girl tough enough to be on equal footing with him, and she's also the only one I sensed chemistry with (Ayu's too cold and Natsu is too complacent for him). But just as with Basara, this author has a tendency to stick to pairings once she decides on them, and the Arashi-Hana angle was built in from the start. They're pretty much the Shuri-Sarasa of this tale. The more recent chapters have also focused on the Aramaki-Ayu pairing, which is just a big no for me. She's the pretty, cold and strong girl from Team Summer A, who on paper is the kind of character who'd appeal to me, but I find myself completely apathetic towards her. It's a nice opposites-attract type of end game, but it also feels too predictable and seems like a rather big waste of Aramaki. He also had way more chemistry with Hana, imo. Also, is no one else shipping Ango and Ryo? Those two ending up together is about the only way to redeem these otherwise obnoxious dudes. I know, I'm grasping at straws here, but I've liked the idea of them together since it became clear in their childhood sequence that Ryo's been constantly watching out for Ango (he even gets asked if he likes Ango! Which he never really answered). The idea of these two settling down with the two girls of Summer B is just so bleh and unbelievable to me, not after all the crap they went through. 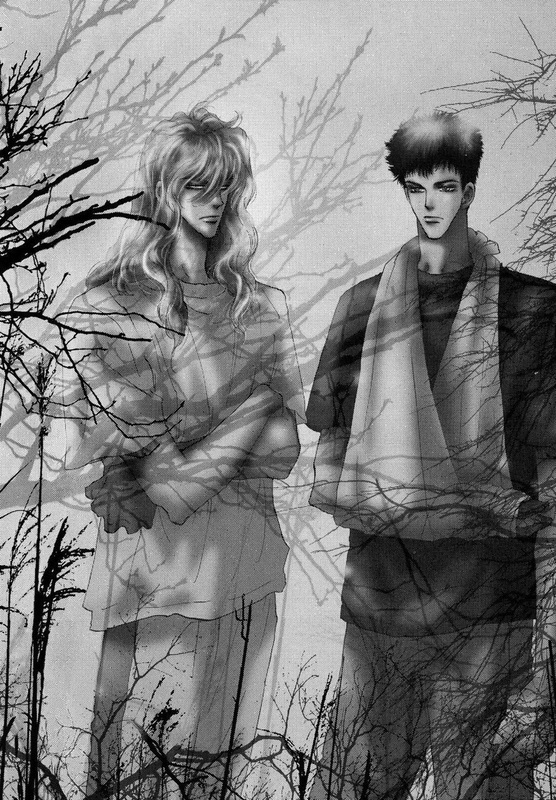 And it honestly wouldn't be realistic without at least one guy x guy pair in this new world. My absolute favorite arc in this story is the flashback to the days in the Ryugu Shelter, Ash Chapter. Even the images of Pete make me want to tear up. If anything, you could read this as a standalone and it's phenomenal. Tragic, yes, but amazing. My second favorite after this is the flashback of the upbringing of Team Summer A, Hail of Corn Chapter, which was good but felt a bit predictably dire. I loved the musical references though, which drove home the dark, orchestrated atmosphere of the whole plot. As of chapter 123, the story is still in the thick of the teams' adjustment and imminent reunion. At this point, multiple teams have made contact with one another, but they haven't all gathered together. More importantly, Hana and Arashi have yet to catch sight of each other. The bad news is even now it feels like we've barely scratched the surface of this story's potential, meaning this will probably be one loooong series. There's so much still to be done, and the majority of character pairings remain up in the air. Of course, it'd be boring if they all started cooperating together and settle into mundane living, but I can see that's the end goal. At this rate though, it'll be years before the series is completed. 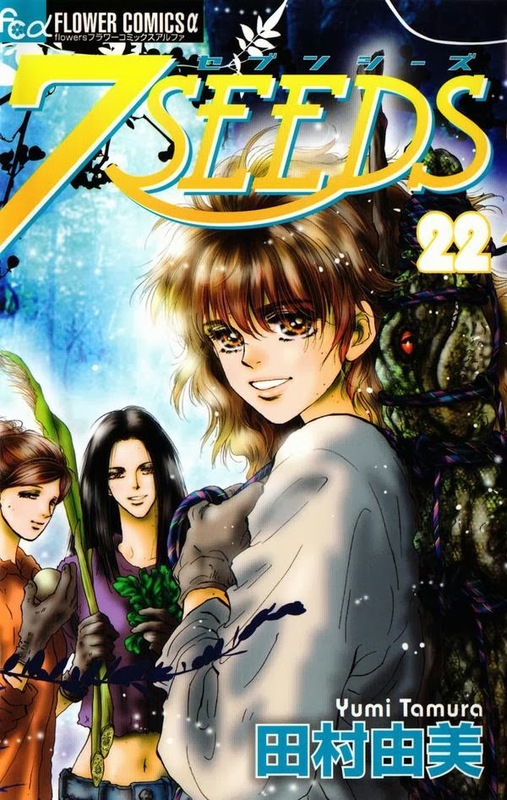 Mangas always seem to have a terrible rate of return - the mangaka spends ages drawing and creating a story, only for readers to breeze through them in minutes. But stories like this make the wait worthwhile, and honestly I couldn't imagine either a live action or a novel doing this justice.